One of our my biggest challenges with home learning is moving into the step of Student Led Learning. I call it “Do the Next Page.” It takes us quite a long time to move into the do the next page. Especially with reviews, or new books, new projects, new bunny trails. Or if we have more than one resource for a subject. How do I communicate the path to reach our goals for the week that empowers them to work independently? I was interested in a new product called My Student Logbook . The website – My Student Logbook ~ (http://mystudentlogbook.com) shows a simple book, with simple lines. I watched a few videos on their site – and thought – why not? 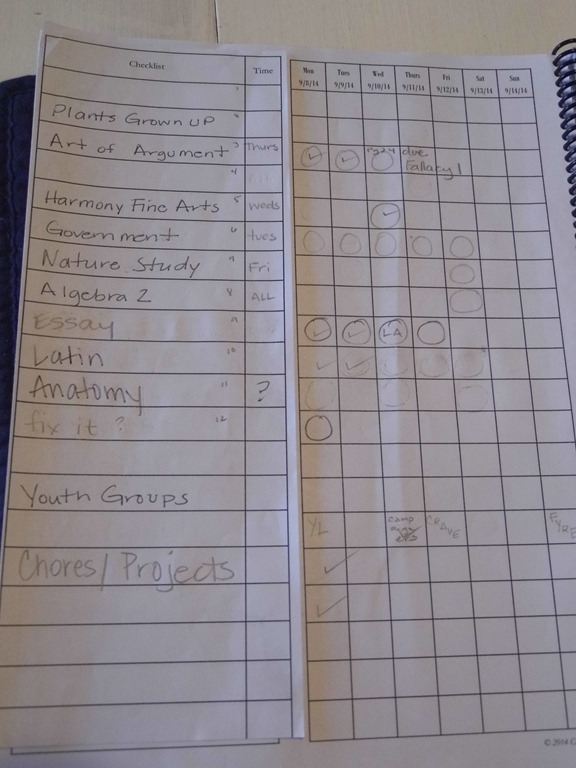 My Student Logbook is a simple product that resembles a blank notebook page. There are dated and undated books available. 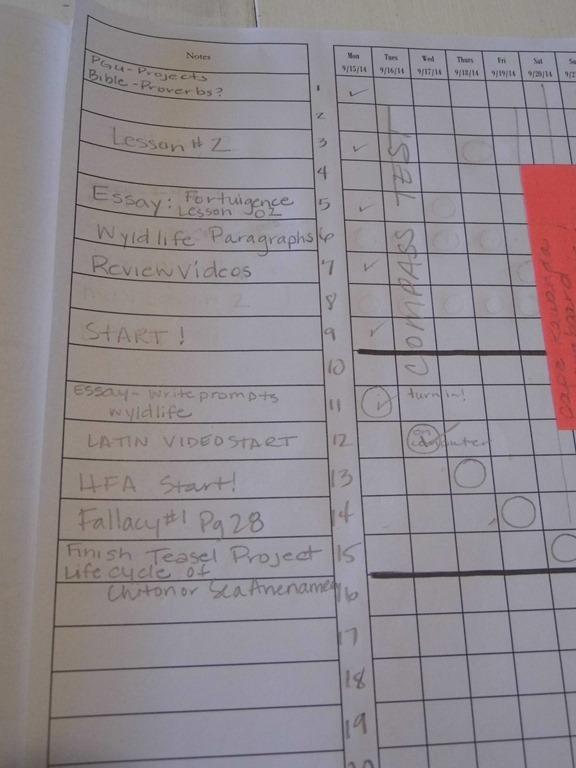 There is a flap that you create that has a re-usable checklist. This is slid over a spot used for notes, followed by 7 blank squares. There are 20 lines available. That’s It. Gone are the inspiring quotes, notes to teachers, notes to students, monthly charts, etc. I wasn’t convinced that it would work for us. My first impression was that it would add more work for me. I also thought that I could probably do the same thing with a notebook. I wondered about the checklist sleeve. We started using this a month before ‘school’ started. You may watch detailed videos on how to set it up on their website. There are several sheets of blank pages for the checklist. This gets torn out, trimmed, folded over and taped onto the week. This is for your outline intended to use over a few weeks. We started ours very basic, Bible, Chores, Learning and Work. When you flip the sleeve up, it reveals the notes. This is where you can write in the specifics for the day. There is a spot to write in how much time and a square for each day. One of the issues we have is having a Teen son with a Job, Volunteer work, Sports and Outside Classes. I could very quickly see that this very simple form would help us set the priorities for the week. In a glance we could see what was coming up, and see how to fit learning and chores into the week. On this first week – I was convinced. Our system so far, was to create something similar on the White Board. 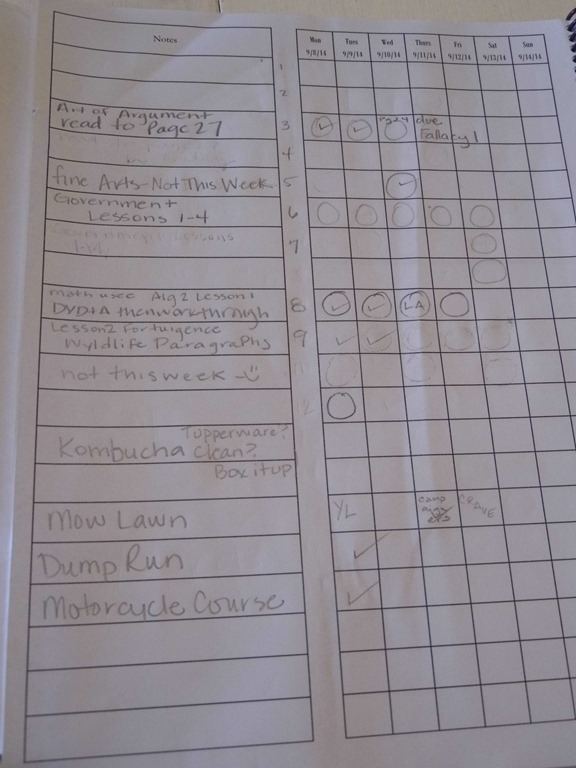 I use an online program and a few forms to help me keep track of the resources we use to meet our learning goals. I’d go through these tools and then write them on the wall. The problem – this stays in the dining room. It renders the whiteboard useless for other tasks. If someone gets rambunctious with erasing, then I have to re-write it. It has to be written daily – at most weekly. My Student Logbook eliminated the need for the whiteboard lists. As our school week started, we used a new page for the checklist. 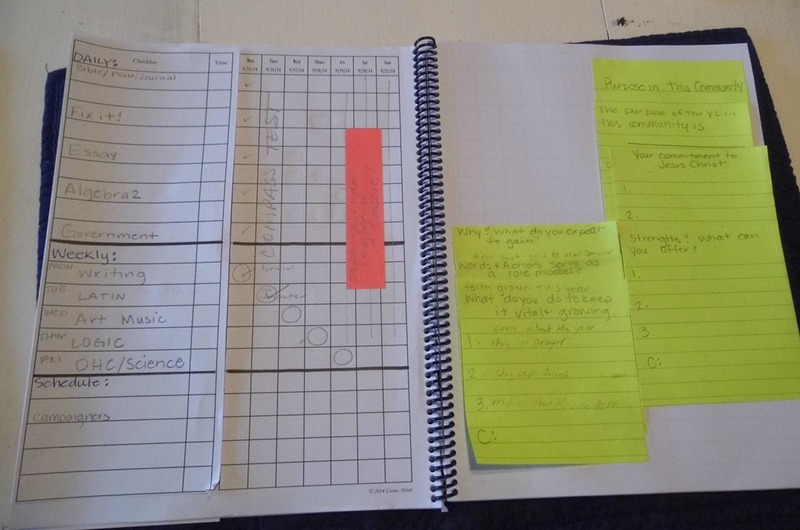 I wrote out the subjects and activities, and then used the Notes to communicate how much work, which lessons, what pages, what chores needed to be done. I used the squares to show what days I expected them to be completed by. Some things are once a week, others daily. This seriously helped communication between my busy son and I.
I am a huge fan of Post It Notes. I noticed a large blank space there on the right and wrote out a few more detailed notes. We are using a new writing program, so I wrote the instructions of how to log on and how to access the class. He has writing projects for being a Wyldlife Leader so we wrote some writing helps to finish those projects. I’ve used post it notes to block out a date, above in pink is to show a weekend event. I found that it was easier for us to make sections. Days, Weekly, and Schedule. This has eliminated all of the circles. I don’t always know Nate’s schedule, so on the week above, I didn’t write it in, he keeps it on his phone. I still want it on there, to prompt him to prioritize his learning and responsibilities. We are getting to our phase of learning – ‘Do the Next Page’. Now I am not writing as much detail, just helping him to see what the learning goals are to finish on our agreed timeline. I found that if I numbered the page, and numbered the flap, it was easier for me to write it out. One question I had in the beginning – would this be more work for me? Yes, and No. I’d write out these steps either way. Even if I print them out of their online schedules, it still takes time to generate the report, print it out, and put it in their folders. If I use the online system, I also have to make sure their work is current, so generates the right lessons for the week. I have found over the years that keeping that software current takes quite a bit of time! 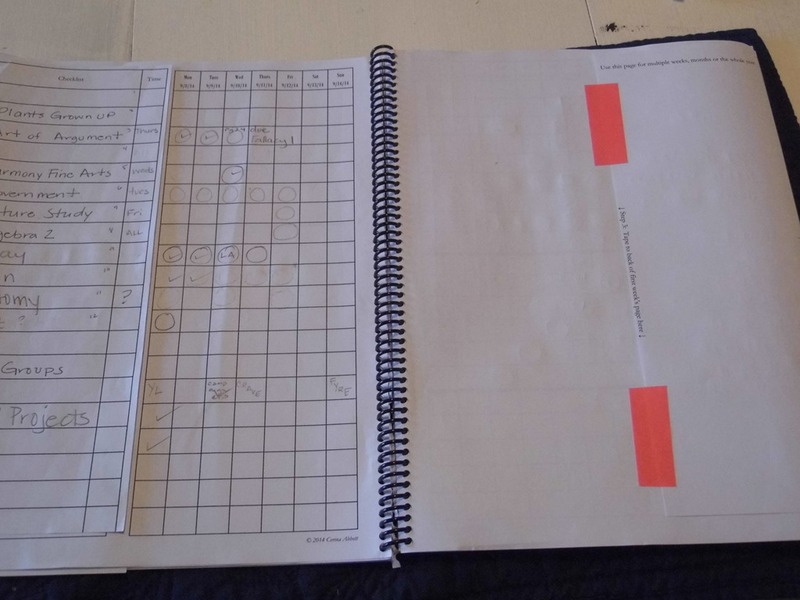 I like that the Checklist Flap is basic, and it is simple to write in – Lessons 4-5 or Pages 22-28. I noticed that you do need to pay attention to how you trim the checklist page and fold it just right to make sure it lines up easily. It’s not difficult, just takes a bit of paying attention. One thing that I did this week was to use a strip from my post it notes to use as the adhesive. I didn’t like the tape. If you had a tape runner that was post it – that would be best, in my opinion. I wondered if we really needed the flap/checklist part. My decision is yes. It helps me focus on our resources available. 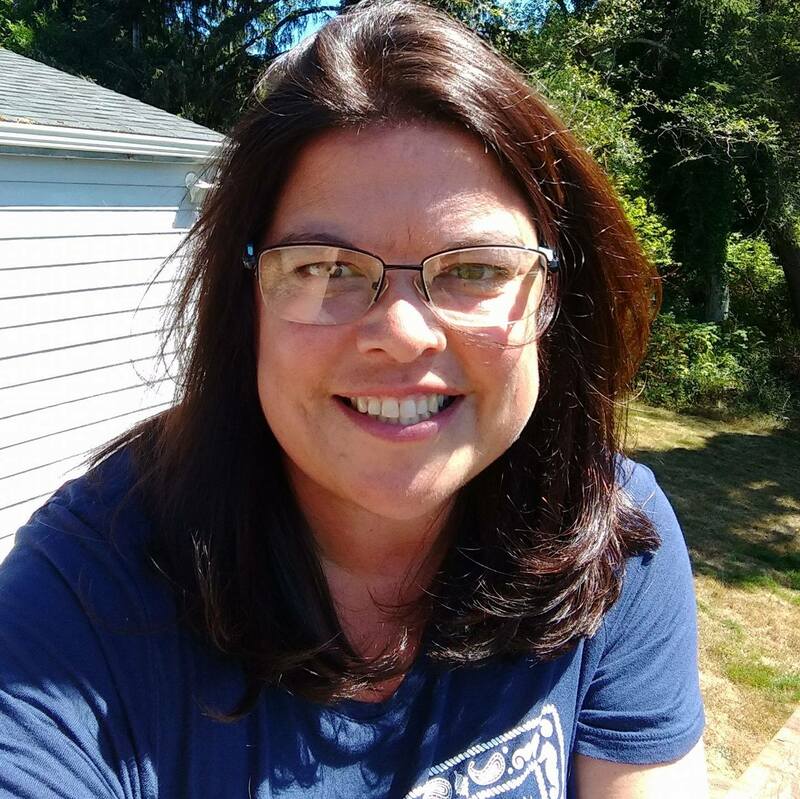 Especially since we are reviewers, we are often changing resources for a goal – English, Science, Math – they need to know what needs to be used each day. For wondering if this would work with a simple notebook? My decision is – No. The pre-printed version we received has the dates printed in. That makes it less work for me. The bold lines and boxes – preprinted are super simple to use. My Student Logbook has a sturdy plastic back and a clear plastic cover giving it stability to write on. The publishers started with the simple notebook, and created this great product for us. I say, let ‘those who have gone before’ take the hard work out for us. Would I like PDF or Pre-Printed? Dated or Undated? I really enjoy having the spiral already printed for the year. I have used the dated one and that takes a lot of work out for me. If we have an event further along, I can easily flip to those pages and fill it in. This isn’t our calendar – but it is about putting our responsibilities in a priority line. The PDF is to be used for one year, as these workbooks are consumable, so is the PDF form’s intention to be consumable yearly. It might be nice to have a printed blank form – but I think the dated one keeps me on task and makes the days count. Does it work for us? Yes. So much so – that I will be ordering two more for the other students. Which is another point – this really does seem to work best for one student. If I had two students on a small load – that might work, but the book is not intended for the teacher –as the name implies – it is for My Student. I like that my son can take his books in a backpack, throw this in, and get his work done in town. 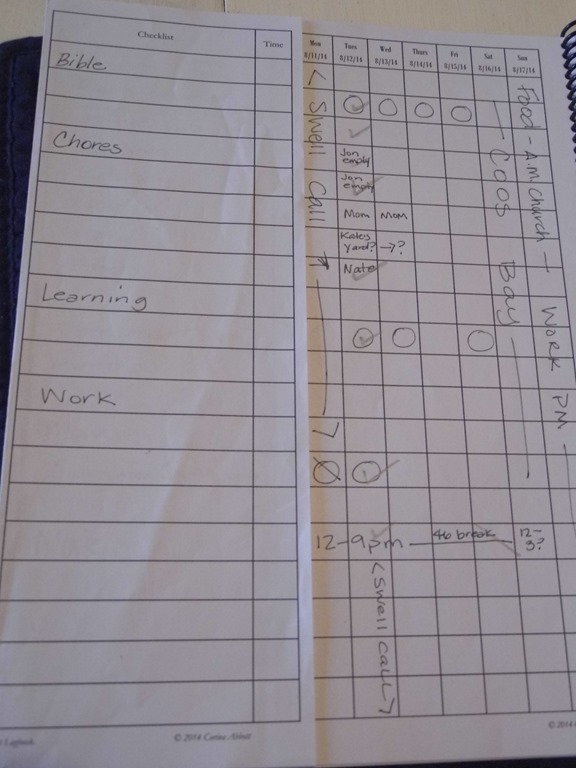 Find out more about My Student Logbook on Facebook and You Tube. You may visit the product page at My Student Logbook to see the various cover designs. 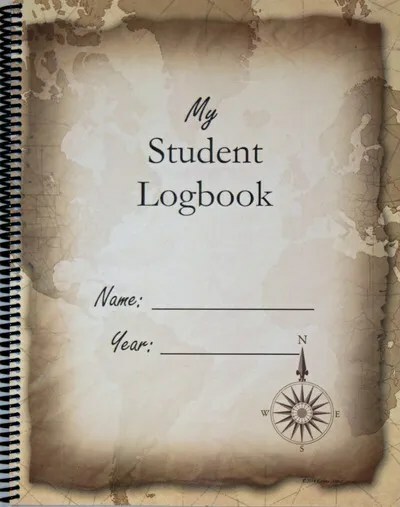 My Student Logbook – printed is $15.00. Mine is printed through August 8th, 2015. PDF versions range from $10-$20 depending on student use. This product is recommended for 2nd grade and up. We have used it for High School. 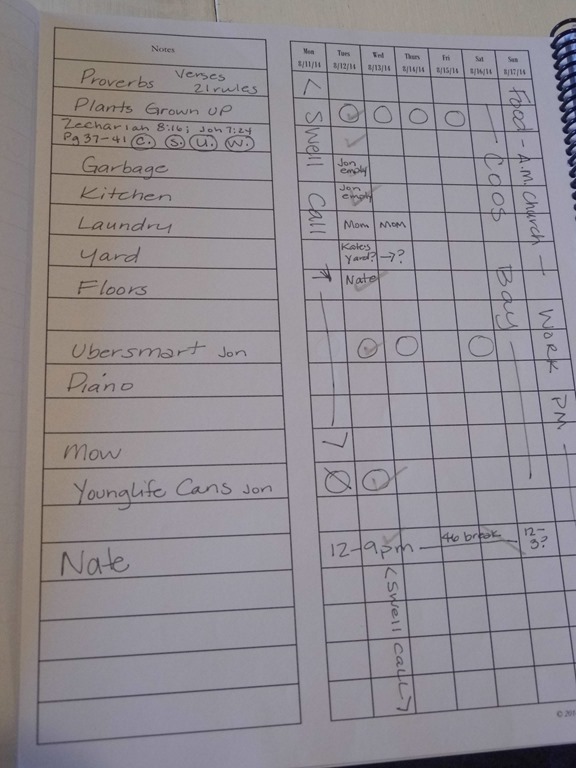 I think it would be a great mom planner as well for the littles. 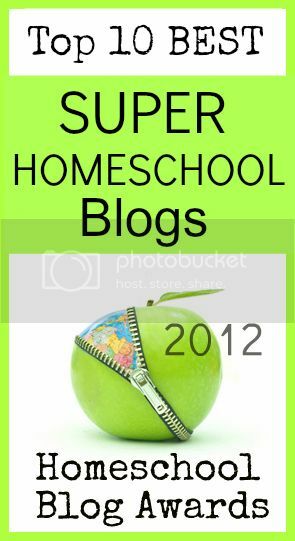 This entry was posted in College Prep, Reviews, Schoolhouse Crew and tagged hsreviews, mystudentlogbook., student planner student logbook student organization homeschool planner homeschool organization homeschool lesson planner. Bookmark the permalink.